The location was in downtown Washington DC on a stretch of sidewalk that separates two of the buildings I visit on a very regular basis. I usually am driving the car, while Taylor makes this short walk, to stretch his legs and grab some outside air. The "Take It!" came from having made the walk myself on this date as Taylor was recovering from a hand injury and we made an exchange of duties in running the usual route. I walked this section of the route and had the chance to do my usual "watch your step" routine. I found that upon completing my walk on this short stretch of street light illuminated sidewalk that I had stepped upon something unusual. I stopped and turned around to look back to see what it was, and found this friendly shadow of a small tree. It took a little while for me to recognize how all of this had come together ( walking on a shadow ), but when the realization hit me - I had one of those grand moments of joy in the discovery. The After Take: I have shown this photo to numerous people without having made any introduction to what it was that they were about to see. It is ever so enjoyable to observe the expression on their faces as they absorbed what they were looking at and without exception, state that they like what they saw. I then launched into a little bit of how this is a capture of what we all engage in all the time, That being the practice of walking on shadows. Yes, it is for most of us, done without giving it a first thought, let alone a second one. 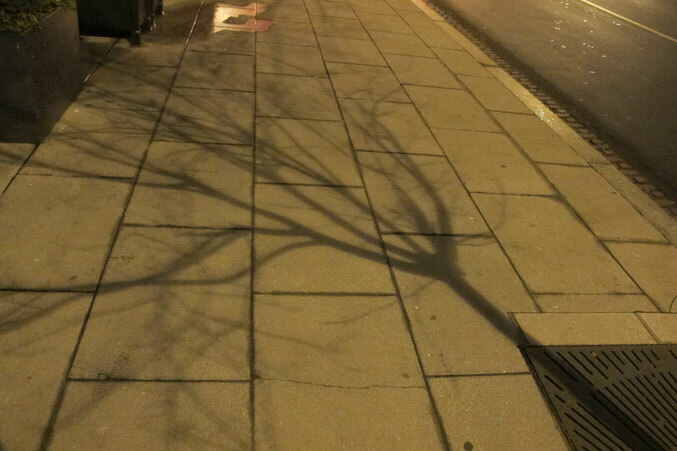 In this photo, the tree is small enough to fit within this section of sidewalk allowing the concrete rectangles to become a canvas of sorts. In its face, nothing spectacular, but with just a little time in thought, this becomes a very lucky catch. Since taking this photo I have become even more aware of the many shadow tapestries that are laid at our feet for us to walk on without a second glance. The shadows formed from the sun during the day are dynamic as they move with the arc of the clock as are those cast by the moon. Those cast by the moon are to be found in a variety of intensities in accordance with the cycle of this wonderful heavenly body. Then there are the night shadows cast by street lights, which this one happens to be. They show up in the same place every night and only change if the wind is strong enough to move the branches. This image arrives with the evening and departs with the dawn. All are simple wonders to behold. Here is hoping you will join me in the awe made available wherever we may be in observing the shadows that share our space. This has a spooky, ominous look to it. Really cool photo. Man it looks like a huge spider web. Such a beautiful picture. Even in the shadow of a leaf stricken tree. The beauty is there. The line work in this picture is all over the place. From the cracks, the squares, and the shadows.....its an intense pic! This is a fun picture to look at. I may use it when Halloween rolls around.